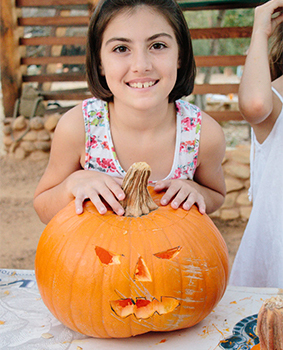 Join your own kids for some pumpkin fun! With a hop, skip and jump we’ll go over the enormous Atlantic Giant pumpkin into the Snail, covered with climbing calabashes and gourds, for an exciting treasure hunt. As we walk through the belly of the Puff Adder, children of all ages will learn about the different varieties of pumpkin: Turk’s turban, flat white boerpampoen, deep orange Cinderella, delicious golden hubbard squash, speckled swan, best-to-eat muscat and, of course, Halloween. With the help of their parents, children will cut, scoop, hammer and hug their pumpkins into shape until sunset. As we’ll be working with sharp objects, children must be accompanied by an adult. Maximum two children per adult. After all the hard work, it’s time to light the candle inside the pumpkin and enjoy pumpkin treats from the Greenhouse.